The skin found is from a snake of the genus Eunectes, an aquatic snake of South America. John Placyk, Ph. D. Associate Professor of Biology University of Texas at Tyler. John Placyk, a University of Texas herpetologist, ran genetic testing on the snake skin for Westbrook police and he confirmed it was an anaconda skin, according to Captain Sean Lally of the Westbrook Police Department (WPD). Record anacondas measure 15 to 17 feet long. 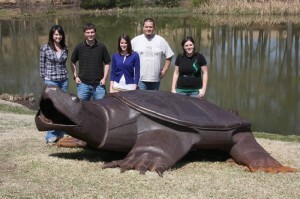 Females are bigger, and they can range to 20 feet long. (After breeding in the wild, some anaconda females eat the males and go 7 months without eating until the live birth of their young – which average 20-40 at a time, but may be as many as 100 offspring. The females can carry around sperm inside their bodies, waiting to “mate” when they wish. Captive breeding can occur even before a “wild” released female anaconda is being seen.) I am a friend of John’s, and I was able to obtain some further details about the exact species. 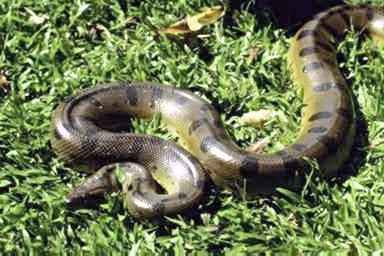 It is a Eunectes murinus, which is a green anaconda (pictured above), with this specific one being from Peruvian ancestors, but the gender cannot be determined due to some marker difficulties. 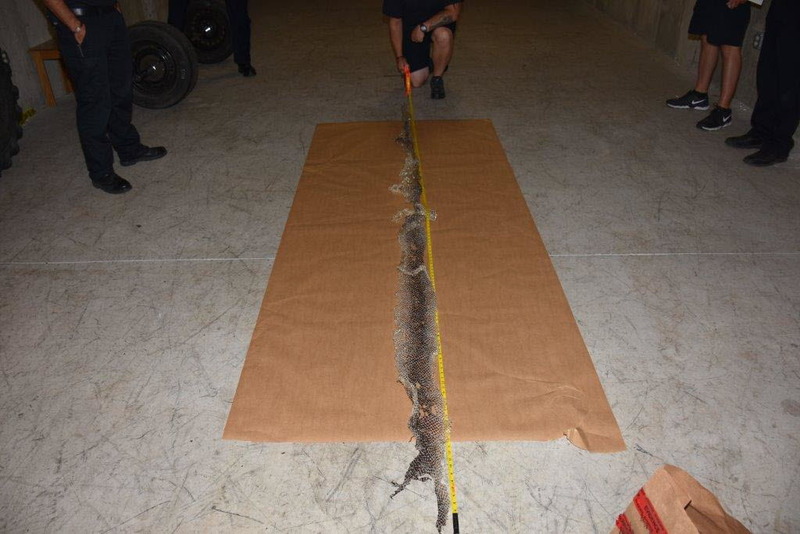 The Maine find, a 12-foot plus snakeskin was discovered at Riverbank Park. 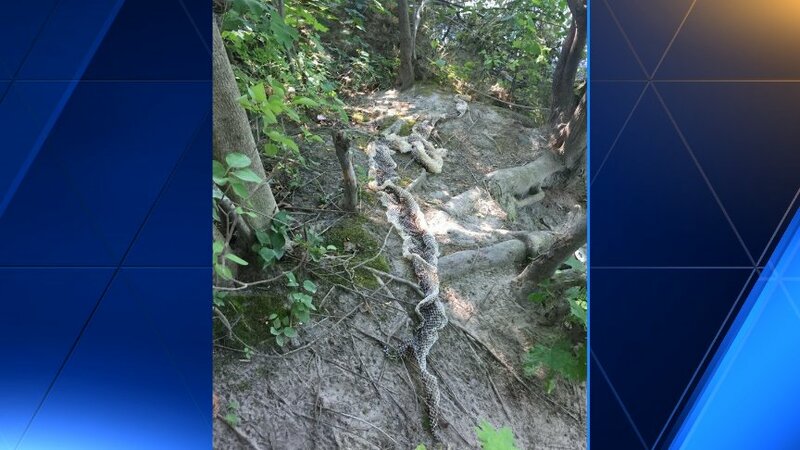 Westbrook police continue to warn the public about snakes after that large snake skin was found near the Presumpscot River. The WPD commented that they do not know if this skin is a planted hoax, from an escaped anaconda, or what circumstances resulted this summer’s events. Based on how much a skin shed can stretch, the 12 ft plus skin is thought to have come from a skin from a live snake that is 8 to 9 feet long. That would make this a juvenile anaconda. While it may not be a threat to adults (except through biting), it may cause a deadly encounter with small pets and children. 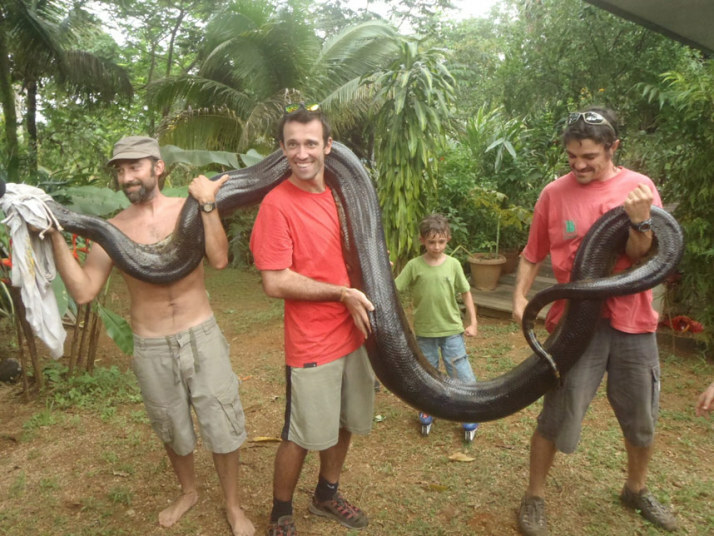 Sebastien Bascoules and his friend pose with a captured allegedly 17 ft long anaconda, which ate a pet dog in Montsinery, French Guiana. Telegraph, UK. Police note that anacondas are not venomous. These giant snakes kill their prey by constriction and would bite deeply, hold on, and squeeze to death their next meal. 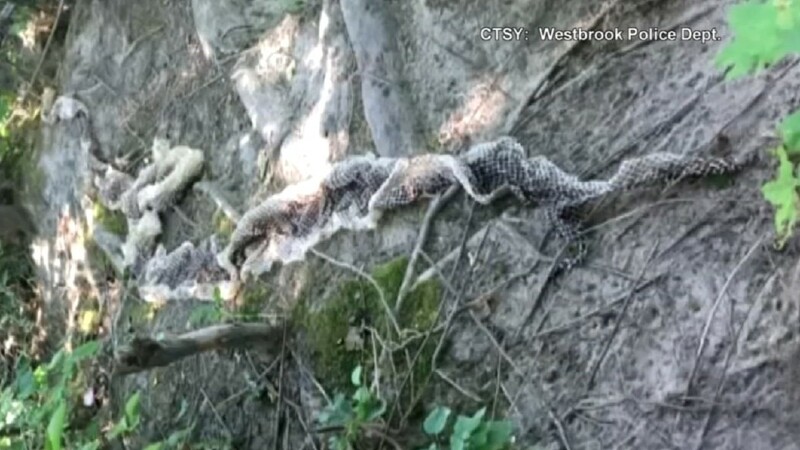 Westbrook authorities ask that if you see a large snake call 911, and local police will confront the snake. Westbrook police said they continue to work with specialists to strategize on ways to locate and capture or euthanize the snake. The International Cryptozoology Museum and our staff of cryptozoologists (director Loren Coleman, and assistant director Jeff Meuse – seen below at the bridge near most of the Wessie sightings) and associates have searched, and remain available to the WPD. The area is near where a large snake was first spotted in June, and there have been other sightings since then. The snake has been give the nickname “Wessie,” due to this being Westbrook, and in the tradition of Nessie, Cassie, Bessie, Tessie, Cressie, and other water cryptids. I recently wrote a contributed column for the Bangor Daily News – Portland, to place this report in context. I have actively suggested to the City of Westbrook that a sanctioned cryptotourism “Wessie Weekend,” “Wessie Week,” or “Wessie Wednesday” be planned for 2017, to celebrate all the interest in this cryptozoological incident. 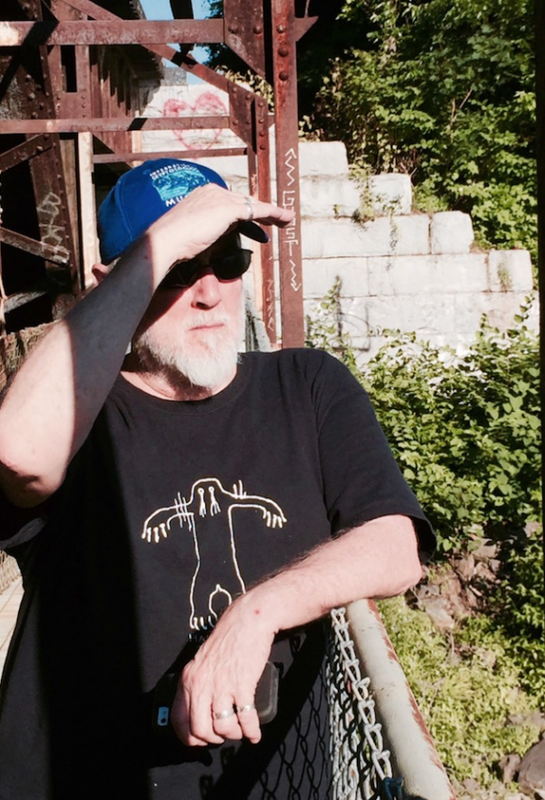 Loren Coleman, director of the International Cryptozoology Museum in Portland, looks for Wessie by the Presumpscot River. Since late June, a series of reports of giant snake sightings in Westbrook has transfixed the state and nation. The first witness said the snake, spotted at Riverbank Park, was “as long as a truck and [with] a head the size of a small ball.” Later, two Westbrook police officers described the same mystery animal: an enormous snake, at least 10-feet long, which appeared to be eating a beaver. But this isn’t without precedent. Two historical Maine incidents of 10-foot-long snakes have been documented. Cryptozoological historian Chad Arment mentions these two cases in his 2008 book, Boss Snakes. The October 1878 sightings by the inhabitants of Winslow, Maine, on the banks of the Kennebec River, tell of a large, spotted snake, eight to 10-feet long, accompanied two smaller snakes. First seen by Mrs. Smiley, and then by Deacon Palmer, these two people were the primary eyewitnesses. Palmer felt for sure the giant mystery snake was 10 feet long. 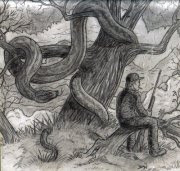 Then in August 1895, a man in Gardiner, near the Pickering farm on the Brunswick Road, said he saw a “10-footer” — a giant snake unknown for the area. Perhaps more comparable to the high interest over “Wessie” this summer, were the “Giant Pennsylvania Snake” sightings beginning in July 1833, and lasting through 1875, from southern Pennsylvania and into northern Maryland. This monster snake was said to be 15-20 feet long, and called a “Devil Snake” when first seen on Big Round Top, south of Gettysburg. The 25-foot-long snake of Allentown was seen chasing and eating roosters and cats in 1870 and 1871. Just across the border, the 15-foot “Anaconda” of Hall’s Springs, Maryland, reportedly terrorized the summer of 1875 by swallowing pigs, a turkey, and a chicken. These giant cryptid snakes were never caught, but kept locals on the lookout for monster snakes for 42 years. A period illustration of Pennsylvania’s giant snake of the 1800s. The story of Ohio’s “Peninsula Python” of 1944 became so famous that Atlantic Monthly in 1945, and newspapers coast-to-coast, reported on this beast through the summer of 1946. Rumors, sightings and encounters gave accounts of a 20-foot-long python seen near Peninsula, in Cuyahoga Valley, Ohio, that supposedly escaped due to a circus accident. Never mind that the alleged circus train was never tracked down. Local people saw the snake and described it as “round as a telephone pole and twice as long.” The Peninsula Python has become so famous that in 2008, more than 60 years after the first reports, the little community officially began celebrating “Python Day” every July 19 in the village, with pie-eating contests, live snakes on display in the local library from the Akron Zoo, snake-face painting for the kids, live music, python t-shirts and a “Python Costume Parade” on downtown Main Street. Will a local tradition spring up around Wessie? A local “Wessie” beer has already been brewed, with its own Wessie t-shirt, and an exhibit is on display at the International Cryptozoology Museum. Perhaps, someday, a Wessie Festival will be held annually at Riverbank Park. Loren Coleman is director of the International Cryptozoology Museum at Thompson’s Point in Portland. 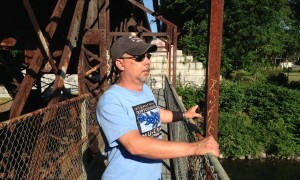 On a recent summer afternoon, Loren Coleman, the world’s leading cryptozoologist and author of more than 40 books on the likes of Bigfoot, sea monsters, and Chupacabras, walked along the banks of the Presumpscot River in downtown Westbrook, scanning the dense vegetation for a 10-foot-long, beaver-eating snake with a head the size of a soccer ball. “Seen any snakes lately?” Coleman asked a couple with a stroller. The mother shook her head. “There’s no snake!” she yelled over her shoulder, walking away. Coleman’s used to being brushed off, and he himself often doubts the true believers. In Maine, Coleman’s well known for founding Portland’s International Cryptozoology Museum, recently reopened in the trendy multi-use development at Thompson’s Point. He has a background in anthropology and psychology, so he takes particular interest in the pop culture that surrounds phenomena like Wessie — now the possessor of a Twitter handle, subject of a folk song, and name of a beer at a Westbrook brewery. 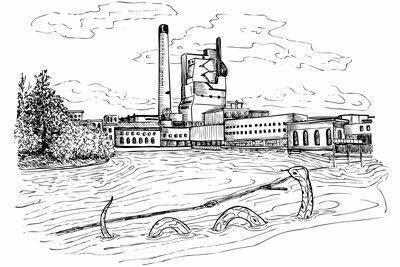 Many have taken solace in the fact that Wessie will likely freeze to death come winter, but Coleman wonders if the mill’s warm outflow might keep the snake alive. As a boy in Decatur, Illinois, he heard reports of rogue alligators swimming near the corn mill downtown [a 6 ft long gator and 12 babies were once caught near the factory's warm outflow]; ever since, he’s devoted himself to what he considers the true goal of cryptozoology: discovering new species. He’s wary of news media’s tendency to sensationalize obvious hoaxes. With the DNA results in that the skin was an anaconda, the interest level remains high. 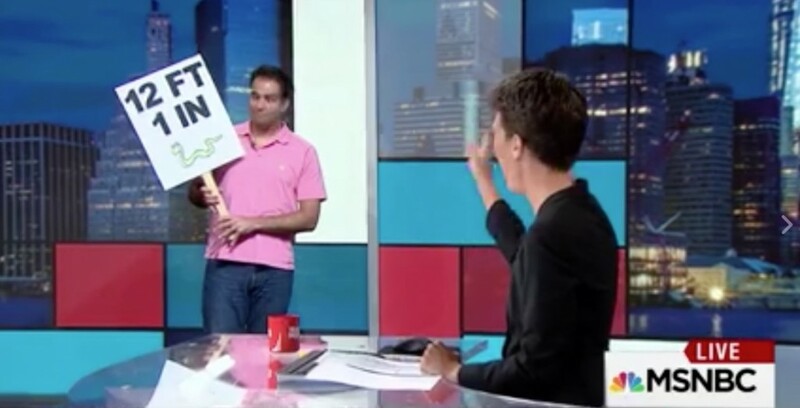 Even The Rachel Maddow Show broadcast a long segment on the story. Previous Entry: Wessie is Real!